With over 40 years of experience in handling truck accident personal injury claims and wrongful death cases, we offer expert legal services for personal injury claims in Hacienda Heights, Los Angeles County and all around California. The entire process of collecting or filing for damages against the insurance company for the responsible truck driver can be a taxing task, but with personal injury lawyers and legal experts by your side, rest assured that every concern will be taken care of. 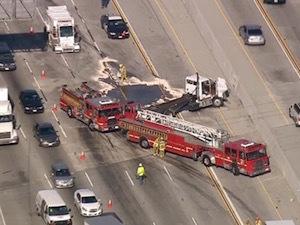 Our Hacienda Heights truck accident attorneys and law firm provide expert personal injury legal services for those injured not just in truck accidents but in car, automobile, motorcycle, bicycle and other types of accidents as well. We Can Help You Get Your Rightful Claim! If you’re injured in a truck collision, car accident or other personal injury claim in Hacienda Heights, you can contact us for a completely FREE CONSULTATION. Please visit our home page, our lawyer profiles or our testimonials page to know more about our experienced and compassionate personal injury lawyers and law firm. You can even visit our Truck Injury Accident website to learn more about the truck accident injury claims process. There are many time deadlines and procedural rules, especially with the California DMV and insurance companies. Don’t lose your rights by not complying or by saying the wrong thing. We make sure that you obtain maximum compensation for your physical damages, as well as compensation for emotional, loss of earnings and other financial losses, and you are encouraged to call us now at 1.866 INJURY 2 or 818.222.34900 (after hours, dial extension 1) or contact us now for help regarding your own particular claim. About Hacienda Heights, Los Angeles, Calif.
Hacienda Heights is an unincorporated census-designated place in and below the Puente Hills, San Gabriel Valley, in Los Angeles County, California. With West Covina to the North, Whittier on the West, La Habra Heights towards the South, and Rowland Heights to the East, Hacienda Heights is a residential neighborhood of LA. According to the 2010 U.S Census, the community of Hacienda Heights has a population of about 54,038. 14% of drivers tested positive for drugs during an examination while 7.3% of drivers tested positive for alcohol. Among all the drugs, marijuana was the most common, with up to 7.4%, a little more than alcohol. Among all the drivers who were killed in fatal automobile crashes in California, around 30% were tested positive for legal and/or illegal drugs, a rapidly increasing number since 2006. Out of the total number of nighttime drivers or nighttime truck drivers, 16.3% were tested positive for drugs, with marijuana being the most common detected illicit substance at 8.4%. On truck & car accident injury & wrongful death accident claim cases, we offer a FREE case evaluation and we work on a contingency fee basis: Absolutely NO fee until you WIN! NO FEE UNTIL YOU WIN! Please contact us now; you will be glad that you did!